Štanjel or in Italian San Daniele del Carso is a village in the Municipality of Nomen in the Littoral region of Slovenia. It is located on the Karst Plateau overlooking the Vipava Valley. In the 17th century it was fortified to defend it against Ottoman raids. It was heavily damaged during World War II and it has been slowly rebuilt since. The castle represents the dominant part of the old settlement. Originally a much smaller medieval building owned by the Counts of Gorica, it was inherited by the Habsburgs, who bequeathed it to the Counts of Cobenzel. With the exception of a brief Venetian rule and the ownership by the Coronini family from Kromberk, the Cobenzel family continued in Štanjel until 1810, when the family eventually died out. From that moment on, the castle was owned by various families. According to dates inscribed on numerous commemorative plaques, we can assume that the Counts of Cobenzel began the renovation of the castle in 1583, and gave it its present Baroque-Renaissance appearance in 1661. Eight years later, the two-winged residence was completed with a walled enclosure and a monumental Renaissance gateway. In World War I, the Austrian Army used the castle as a military hospital for its officers. In the interwar period the castle became the central point of public and social life thanks to Max Fabiani. Here was the municipality, school, library and medical centre. In the summer, dances would take place in the castle courtyard as well as concerts and plays. In World War II it was severely damaged during an attack by the National Liberation Army. Renovation began in the second half of the 20th century. Few reasons to visit Hungary! The remarkable love story of two long-legged birds from eastern Croatia, which has gone on for the last 16 years, continues as Klepetan arrived back home on Thursday at around 10:30 am. The two storks made their nest on a chimney in Brodski Varos in eastern Croatia more than two decades ago. The pair would fly together until Italian poachers injured Malena’s wing which left her flying capabilities restricted. With storks being a migrating bird, this caused a problem. Every winter for the last 16 years Klepetan would leave Croatia and make his way more than 13,000 km to the warmer climates of Africa. Without fail, however, Klepetan has always managed somehow to negotiate his return to Croatia in the spring when the weather warms up to be reunited with Malena. However when Klepetan failed to turn up by the end of March last year the nation began to worry. He did return though two weeks late keeping the love story alive. “It is true, Klepetan has been late 3-4 days than when he was younger. The journey is long, more than 13,000 km. Last year he was 2-3 weeks late but nobody is happier than Malena and I when he arrives,” Stjepan Vokic, who has taken care of the birds in Brodski Varos for over a decade, told 24sata. The famous love story continues. Snow does not fall often in Venice and when it does, it doesn't stay on the ground for long. If you are lucky enough to be here when it snows do not waste any time and stay out as long as you can to capture magic moments! During your Photo Tour of Venice, I will point out details invisible to the untrained eye and reveal the best vantage-points on your chosen route. Learn to tell a story through images, take great shots of iconic monuments and capture atmospheric images off the beaten track. 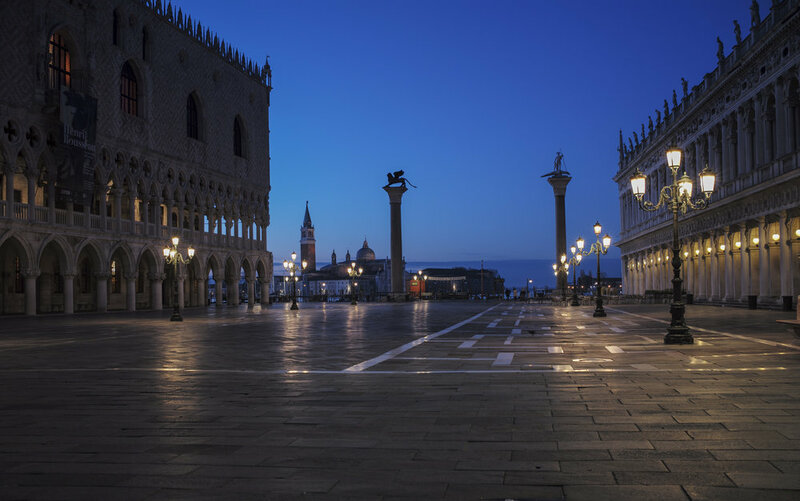 • Discover parts of Venice less travelled by tourists. • Hear interesting tales and stories • Take better photos • Turn your photos into exciting stories. • Have fun! Let a Creative Italian Photographer walk you through the city of Venice in an unforgettable Photo Walk capturing real candid moments of your stay in beautiful pictures. Enjoy a relaxing vacation and bring home remarkable pictures of your visit. Touring Venice can be a very exciting experience, but it can also be quite an adventure if you are unsure of which places to visit and how. The language barrier may also represent a curious obstacle but it can also be frustrating. We offer innovative and unforgettable Photographic Tours to welcome you to the most fascinating and romantic place in the world. Experience Venice through the eyes of a native Italian Professional Photographer. He will guide you in an exclusive tour through the most interesting Venice landmarks and monuments. Walking around Venice together with a professional photographer is an enlightening experience. He will show you all the tricks of the game but it is also a fun and new way to visit a city like Venice. You will be able to visit, see, experience and tour places, situations, people that would be otherwise difficult to come across. The Photo Tours will take you through off-the-beaten tracks to the most important monuments and landmarks. You will avoid the tourist pedestrian highways and will take more secluded, intimate and truly Italian passageways. Let it be romantic, creative, fun and friendly, the astounding imagery will do the rest. We will show you the right places to eat, where true Italian dwell and the hidden beauties of the wonderful city. Ljubljana is the vibrant capital city of Slovenia, with rich history and culture. The architecture is astonishing, and Ljubljana’s cobblestone streets and river banks are made for long walks. The city and its surroundings offer many ways to spend the time when visiting. Ljubljana is young, very hip and green as can be: In 2016 it was the European Green Capital, in a part of Europe not always known for environmental friendliness. The city centre is now mostly car-free, public transport is low-emissions and there’s a new cycling network. 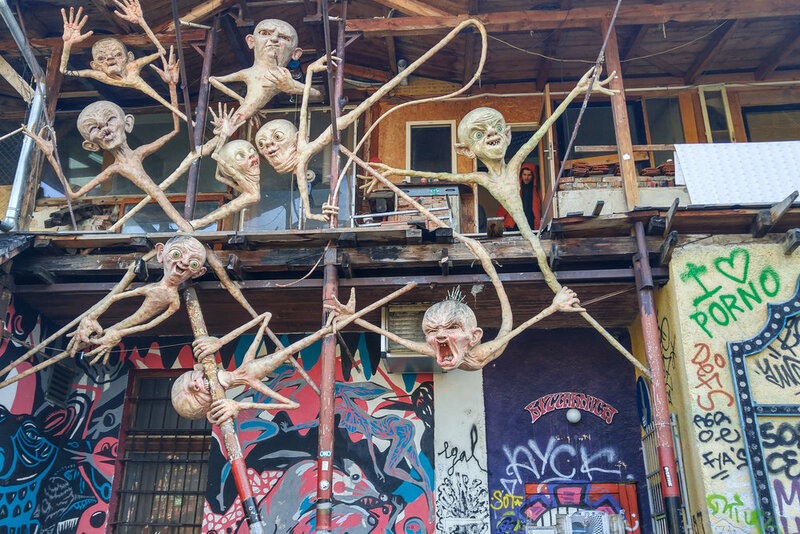 The squat-turned-cultural zone Metelkova is the go-to for hipsters and live music, and has nightspots, bars and public art installations in an old barracks. According to the Quality of Living survey released by Mercer, a well-known international consultancy firm, the Slovene capital Ljubljana is the third best Eastern European city to live in, trailing only Pargue and Budapest by the slimmest of margins. Despite the fact the Slovenia is geographically located squarely in Central (if not Western) Europe, and has always been culturally and politically closer to Vienna and Paris than Moscow, this is still quite an accomplishment. Here is a list of my favourite best things to do, that will make your stay in Ljubljana unforgettable. When you’re looking up from one of the Ljubljana’s squares or the river, the castle seems dauntingly high. If you’ve got the stamina you can try to get up there on foot, but there’s also a tourist train and a funicular railway.The castle has changed a lot since it first came together 900 years ago.The early stone wood and stone fortress was succeeded by more practical military buildings, becoming an Arsenal in the 16th century as a regional bulwark against an Ottoman invasion.The main courtyard is free to enter, and has a cafe, nightclub, galleries and a restaurant. Right by the Ljubljanica, Prešeren Square is the place where the city meets up and celebrate. If there’s an event going on in Ljubljana there’s a good chance it will happen in this space. With a rough triangular outline, the square is at the convergence of a number of major arteries, and gained its current opulent appearance after the earthquake in 1895. This was when regal halls replaced the medieval houses that had been here before, joining the Baroque Church of the Annunciation, which dates to 1795. The square takes its name from the 19th-century poet France Prešeren whose work “Zdravljica”, “A Toast”, became Slovenia’s national anthem. You can find his statue next to the Central Pharmacy, across the square from his unrequited love and muse Julija Primic. Ushering you off Prešeren Square is a group of three bridges decorated with stone balustrades and lanterns. The central bridge of the three is much older than the two that flank it, and dates to 1842. This was intended for road traffic, while the two alongside were added for pedestrians at the start of the 1930 and were the work of Jože Plečnik, Ljubljana’s most revered architect. Also dating from this project are the riverside terraces lined with poplars, and the temple-like flower shop that connects with the colonnade of the Central Market on the right bank. Dating back to 1901, the bridge was built for the 40th anniversary of Emperor Franc Jožef I’s rule and it symbolizes the history, beauty and architectural style of Ljubljana. 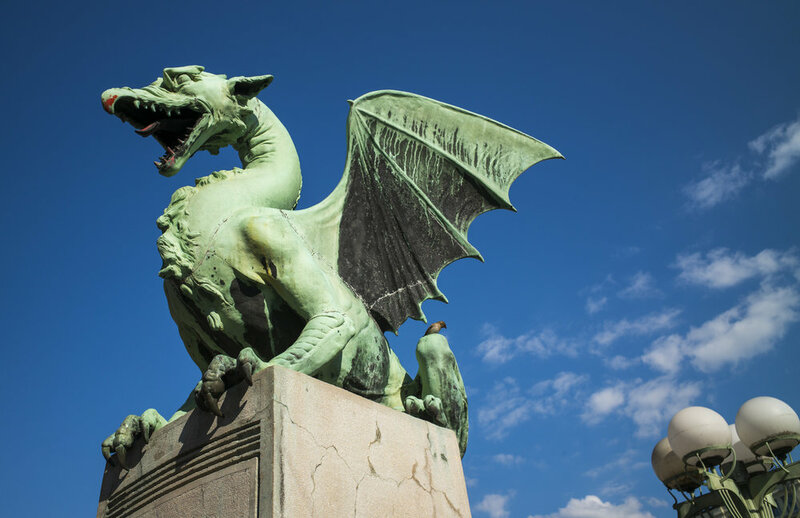 Those dragons have been integrated into the city’s coat of arms, and as a result, they are found all around Ljubljana. Tivoli Park is the green heart of Ljubljana the its biggest. Located on the northern outskirts of the Center District, it offers facilities such as playgrounds, fountains, ponds, exhibitions, mansions and sports facilities. Tivoli Park also hosts a tropical greenhouse managed by the city’s Botanical Gardens and sits beside a pond. But if there’s one reason to come it’s to walk the Jakopič Promenade, an arrow-straight avenue that runs from the eastern entrance up to the Neoclassical Tivoli Castle. Jože Plečnik also designed this market in the early 1930s as part of his beautiful set piece that included the Triple Bridge. It hugs the riverside between this bridge and the Dragon Bridge and is on the site of an old diocesan college for girls that collapsed during the earthquake in 1895. That handsome colonnade on the fringe of Prešeren Square shelters stalls selling herbs, spices and handicrafts, while further along are bakery stalls, cured meat, dried fruit and nuts, dairy products, fresh fruit and veg and fish. The market is open every day except Sunday, while the covered sections have slightly shorter opening times to the open-air stalls. This cultured central square has played host to some momentous occasions in Slovenian history. Independence from Austria-Hungary was announced here in 1918, while Josip Broz Tito addressed the crowds from the balcony of the university building in 1945. Later, the first free protest took place here in 1988, in a movement that would end with Slovene independence in 1991. Finally in 1999 Bill Clinton read the first line of the Slovenian National Anthem to a crowd on this square. Dating to1821, it’s a formidable space that has civic buildings and palaces on all sides and the Zvezda park at the centre. A couple of sights to note are the resplendent Slovenian Philharmonic and the copy of a Roman gilded bronze statue excavated on this site in 1836. Soon after independence, a disused army barracks from the days of the Austro-Hungarian Empire was occupied by squatters to stop it from being torn down. This large space in the centre of Ljubljana has gone on to become an autonomous urban enclave, not unlike the famous Freetown Christiania in Copenhagen. It’s an alternative haven where almost every wall is covered in graffiti and imaginative murals. Come for photos during the day, and return at night when it’s full of life. After dark, the bars and clubs book live bands and DJs, and there are outdoor concerts in summer. Get High in Ljubljana and take the lift to the top of Nebotičnik, the 70 meters high skyscraper with the torch – like top. The views from Ljubljana's Empire State Building are stunning, day and night, and guess what? A glass of red will only set you back 2 euros! One of the cool things to do in Ljubljana at night. If you need to break out into the countryside, this park is only ten kilometres north of Ljubljana and brings the wilderness to the suburbs. Unmistakable for its twin humps, Šmarna Gora is more than 660 metres above sea level, but has been made hospitable by 15 well-tended hiking trails, all serving the summits.When you make it to the top of the eastern peak you’ll be met by a restaurant and a Baroque church from the early 1700s. There’s also a Marian column up here from the same century to mark an outbreak of plague that took place in the 1600s.But the greatest sight is Ljubljana in the distance scattered around at the bottom of Rožnik and Castle hill. The Ljubljanica River is the main river that runs through the old town of Ljubljana and divides the medieval centre with the rest of the city. There are a lot of cafes & restaurants lining the Ljubljanica river which makes it the perfect spot for sitting and watching how the world goes by. 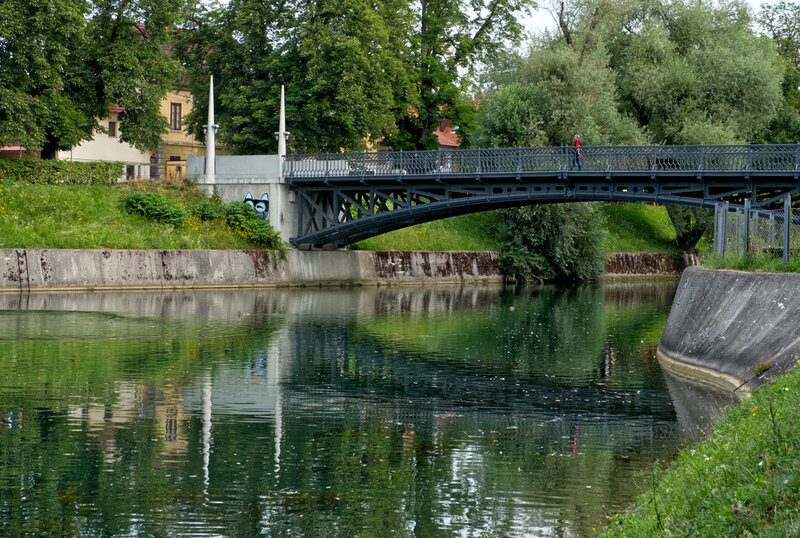 A walk along the river is a good way to discover the beautiful Ljubljana decorated by many bridges throughout the river. Every Friday from early spring to the late autumn, Open Kitchen Market is the best option for lunch in Ljubljana. The Open Kitchen presents the best foods from Slovenia and around the world and wineries and breweries from all over the country offer their best drinks to compliment the food. 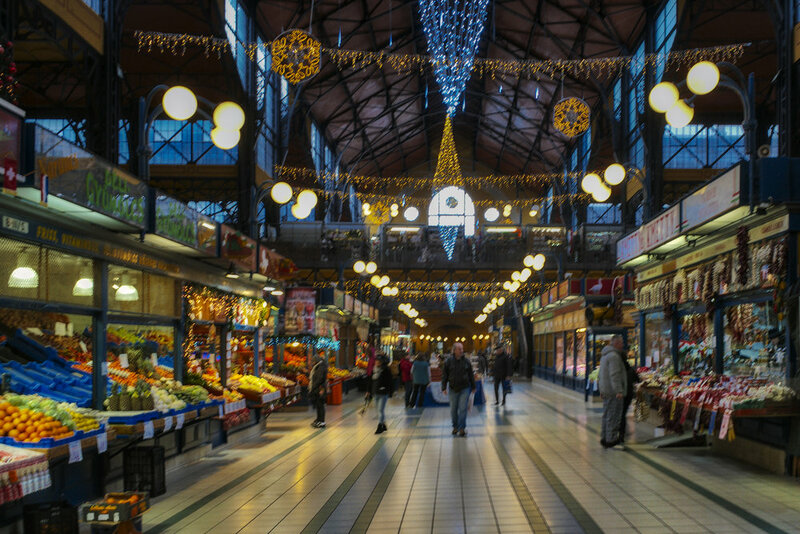 Hugely popular among locals, visiting this market is a great place to get good food and make new friends. It will be tough, but there are lots of lovely day trips from the capital, including the majestic Lake Bled (the town with the church in the middle of the lake) and to the Slovenian/Croatian border where you can go glamping if you are in Slovenia for longer. Let someone else do the driving! Take a tour of Bled, a short hike to Bled Castle and ride the Pletna boats in Lake Bled. Next, explore the Vintgar Gorge then dine at a local Alpine restaurant. It’s not over yet! See the less touristy Lake Bohinj and wander through the medieval town of Skofja Loka. 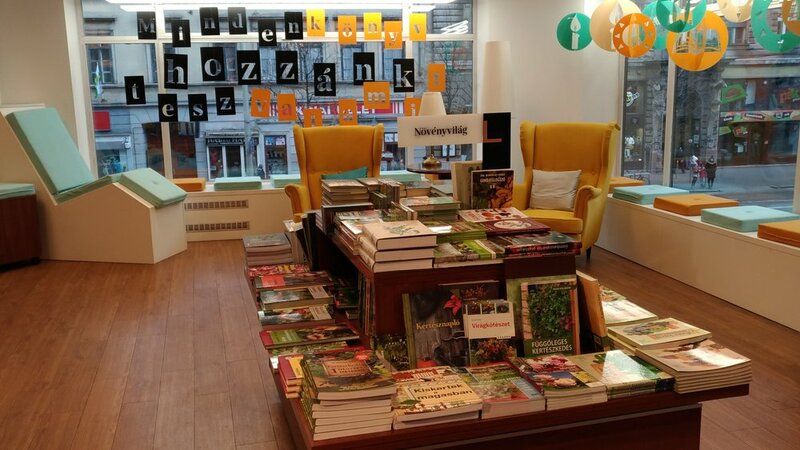 What used to be a tiny bookstore called Azil (Asylum) is now a bookshop café that combines two bookstores and a café. Azil has a bookstore sister called Beletrina next door and a café inside and outside this place. Novi trg or New Square is surrounded by beautiful baroque palaces, so visiting this place will also give you the possibility to see one of the palaces from the inside. Azil is run by the Scientific Research Centre of the Slovenian Academy of Sciences and Arts, so what you can mostly get there is academic literature on humanistic and sociological sciences in Slovene, English, French and Russian. The atmosphere here is truly cosy and you can almost smell all the knowledge that the shelves store. There’s a really good English language selection on philosophy. You can also find books on cultural studies and anthropology, arts, history, gender studies and even comic books. Check out for books by Slavoj Žižek, the most prominent and notorious Slovenian philosopher of all times! Azil is also a bookcrossing zone, so you might even find some free books or leave your own behind. My favourite here, the excellent selection of comics! Konzorcij Bookstore and Stationery Mladinska knjiga založba d.d. Lovely place with outdoor seatings. This is probably the best café that i have been in years. The location could not be better, it has the historic ambient, the service is friendly and fast, and the cake was just superb. Would recommend it to anyone seeking a good coffee and cake in centre of Ljubljana. Very close to home and a place I miss when not in Ljubljana. The coffee here is free. Ziferblat follows the trend of cafes opening around Europe that wish to work as extensions of people’s homes. This is a place to have coffee with a friend, come to create, read a book, or meet new people. The only thing Ziferblat charges for is time. After finishing coffee or tea, guests pay for the time spent there instead of the drinks they had. 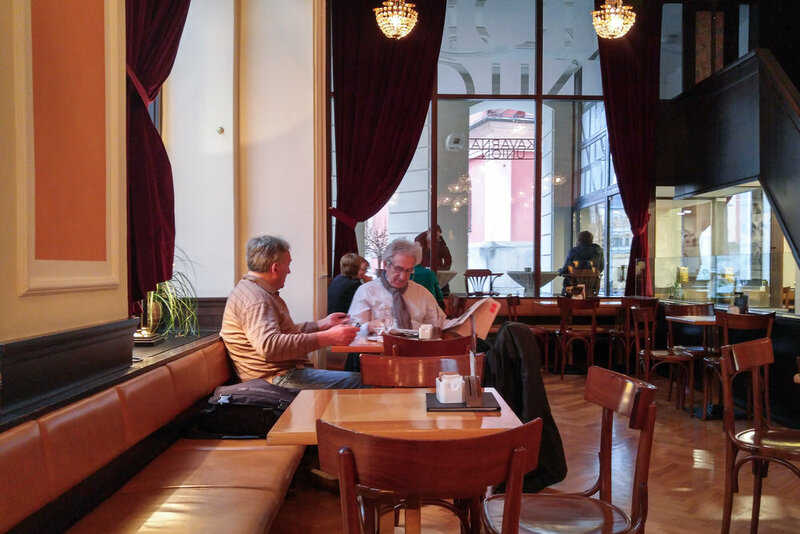 Conveniently located next to Ljubljana’s public market, Café Čokl is a perfect place to rest tired feet after browsing the market shops. The staff of this small and cosy café is knowledgeable and always prepared to help the guest select a perfect cup of coffee. After being shut for nearly a decade, the best views in the city are once again open to the public. Occupying the top floor of Ljubljana’s famed Neboticnik building, the highest residential structure in Europe when it opened in 1933, the terrace’s 360° views from the Alps to the castle to the mountains in the south are truly breathtaking, and the coffee, cocktails and homemade cakes are worth trying as well. This is an absolute must for all visitors to the city. is a great restaurant to enjoy a traditional Slovenian brunch. Located in the old part of Ljubljana’s city centre, it offers delicious food on its terrace or its cosy inside area. Most of Druga Violina’s employees are people with special needs and the restaurant is helping with their inclusion into society. Ordering the traditional Slovenian dish štruklji, made from buckwheat and filled with cottage cheese or walnuts, will make for a brunch like nowhere else in the world. Located in a tiny eclectic neighbourhood, this temple for foodies serves dishes that emphasise traditional Slovenian cooking, but not the sort that makes it onto many standard menus. It's located in Trnovo, and will immediately make you feel at home with its welcoming service.. The food is absolutely delicious! Home-made but creative food, where the ingredients' taste is highlighted. Can't be missed in Ljubljana!! Is a welcome get-away from the busy/noisy town center and offers an experience that is far from the traditional restaurant-food meals. 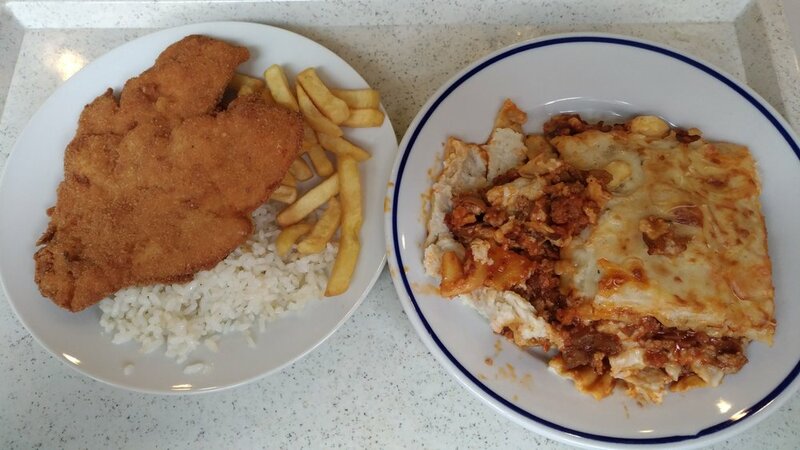 At lunch time they offer a fixed price menu for less than 10 Euro! Klobasarna, located on the premises of a once famous watchmaker's shop, is a fast food restaurant offering the best known traditional Slovenian dish, the Carniolan sausage. The restaurant's menu is simple: it includes the original, high quality Carniolan sausage, recognized as a product with Protected Geographical Indication, served with a fresh Kaiser roll, fine mustard, and fresh horseradish. When you ask locals to name their favourite Balkan restaurant in Ljubljana, Čad is one of the most frequently heard answers. Situated by Rožnik Hill around the corner from Tivoli Park, it's also the longest-running restaurant of its kind in town, and guests can dine in the shady garden surrounded by nature or in the rustic homey interior. Specialising in spit and grilled dishes, the beefsteaks, grilled peppers and ražnjići skewers all come highly recommended. Set along the beautifully redeveloped Breg riverside walk in the Old Town, Namasté is the oldest surviving Indian restaurant in all of Slovenia and offers one of Ljubljana’s most romantic dining experiences of any flavour. With its soft, yellow-hued lighting, hand-painted walls and a relaxed atmosphere, the house specialities on offer here are from the Rajasthan and Punjab regions, are prepared individually with spices directly imported from the subcontinent and can be ordered from mild to extra hot. Sometimes we like to stop by just to savour a cup of spicy masala chai. This tiny takeaway at Bavarski Dvor is a true Ljubljana institution, and has been serving up piping hot Serbian-style burek almost literally non-stop, around the clock since the 1970s. It was the runaway winner of a Battle of the Burek competition way back in 2010, and consistently ranks as a local favourite year in and year out. No night out on the town is complete without a pre- or post-club stop here, so don't be surprised to see a queue at four in the morning. And while they renovated not too long ago, the menu and prices have thankfully stayed the same. Not only does Shambala's kitchen turn out some of the best (and spiciest) Asian cuisine in Slovenia, but the tranquil, almost meditative, ambience of the place allows you to enjoy your meal in a state of perfect relaxation - with some of the best service in town thrown in as an added benefit. During the warmer months, diners can also take advantage of the pleasant little garden that is tucked away in one of the buildings inner courtyards. Situated down a narrow alleyway off Breg, this hidden gem is definitely worth finding. What better way to deal with an exhausting day of shopping than hoeing into a big plate of juicy čevapčiči. Thankfully Balkan Express at the first-floor dining area in City Park BTC has us covered with a solid range of Balkan favourites from smoky grills meats to burek and make sure to leave room for baklava. And if you don’t want to go to BTC but have a craving for pleskavica, Balkan Express also delivers throughout Ljubljana seven days a week. Situated between the central post office and Kongresni Trg on the city's main thoroughfare, we've never found the exterior to be the most inviting but once you get inside it's actually quite warm and cosy. The thick leather covers on the menus portend the ample selection of grilled meat dishes within, although vegetarians have a handful of a pasta and salads to choose from as well. On your way in don't forget to check the table outside for flyers entitling you to a free glass of wine. An interesting new model for a cafe and deli, Učilna Okusov (it translates to ‘classroom of flavours') is a joint venture by three Slovenian vocational schools. 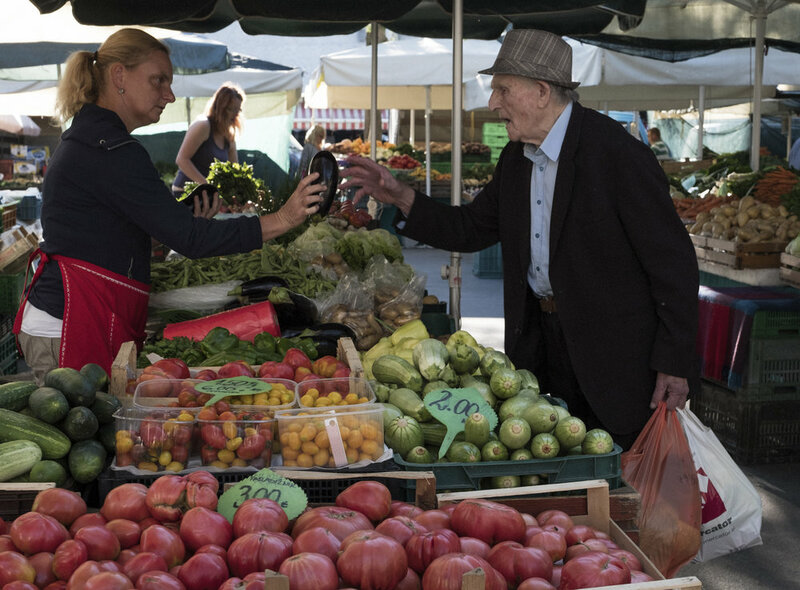 Located beside Dragon Bridge at the Ljubljana Central Market, it is an outlet for quality regional products - much of it organic and some produced by students themselves. Učilna Okusov teaches students hospitality and retail skills, whilst giving market goers and tourists alike a taste of traditional Slovene foods either to take away or stay for a tasty great value daily lunch with a glass of wine, or else drop by for a Turkish coffee and delicious sweet treat. A must stop and an absolute gem in Ljubljana. Whilst this small and unassuming doorway at the very end of the 'high street' does not look like much the bread and the raw produce sold packs a punch. What to do in Budapest! Probably due to the fact I part time live in Hungary, I am often asked about Budapest. So here are my takes and suggestions! Budapest is a big city with several district articles containing sightseeing, restaurant, nightlife and accommodation listings. Budapest (Hungarian pronunciation approximates to "boo-dah-pesht") is the capital city of Hungary. With a unique, youthful atmosphere, a world-class classical music scene as well as a pulsating night life increasingly appreciated among European youth and, last but not least, an exceptionally rich offering of natural thermal baths, Budapest is one of Europe's most delightful and enjoyable cities. Due to its scenic setting and its architecture it is nicknamed "Paris of the East". In 1987 Budapest was added to the UNESCO World Heritage List for the cultural and architectural significance of the Banks of the Danube, the Buda Castle Quarter and Andrássy Avenue. Budapest is home to one of the largest music festivals in the world: Sziget Festival takes place every August. Budapest is the biggest city in Hungary (1.7M) 20% of Hungary’s population lives in Budapest. Budapest is hot' since Budapest has more thermal springs than any other capital city in the world. An amazing 70 million litres of thermal water rises to the surface daily. Budapest is big on art and culture There are more than 40 theatres and over 100 museums and galleries in the city. Budapest was not always the capital of Hungary, Until the 13th century, Esztergom was. I am obsessed by the Fisherman Bastion ...in a photographic sort of way. The proximity with one of my favourite patisserie does the rest! I know they are new, I know they do not mean or serve much I still love them! 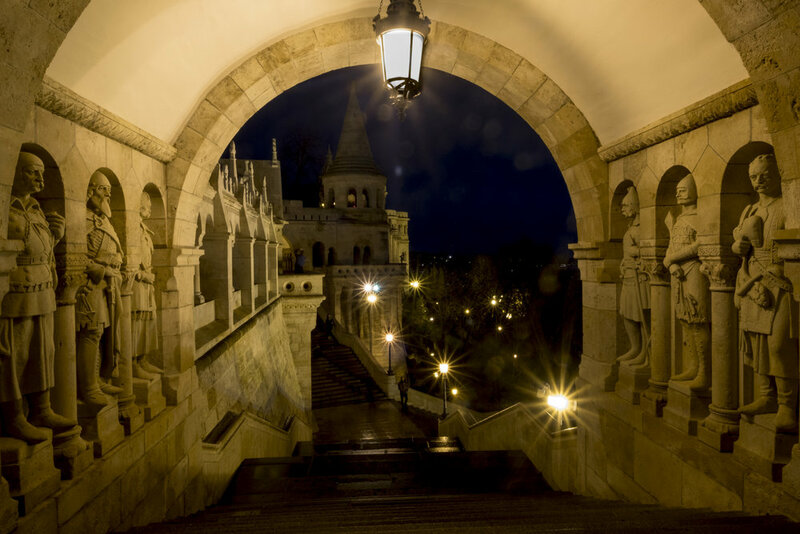 Located in the historic district of Castle Hill, the Fisherman's Bastion (or Halászbástya) is a neo-Gothic terrace that looks like a structure taken straight out of a fairytale. Designed and built between 1895 and 1902, next door – Fisherman's Bastion is named after the medieval guild of fishermen who protected Budapest from invasion. The gleaming white structure provides panoramic views of the city: From here, you can snap some breathtaking pictures of the Danube, Margaret Island and Pest. You may choose to take some time to explore the bastion's seven ornate turrets, which symbolize the tents of the seven Magyar tribe leaders who settled the Carpathian Basin, ultimately leading to the existence of modern-day Hungary. Andrassy Utca is one of the most beautiful avenues in Budapest. The big green trees and the high end fashion stores give it an elegant vibe. Very nice to walk along it.It is a lovely wide avenue for a stroll. There are lots of restaurants and international clothing chains, high end on the street. The Opera is here and on the day I was walking they were making a period movie. It was nice to watch. Several places for coffee and of course, the clothing chain COS is here. If you walk to the end you will pass the Terror House and wind up at the big city park with the zoo. A soak in a thermal bath is a quintessential Budapest experience (it hasn't cultivated a reputation as the "City of Spas" for nothing). These baths, or fürdok in Hungarian, are heated by natural thermal springs and usually include on-site massage services, as well as steam rooms. 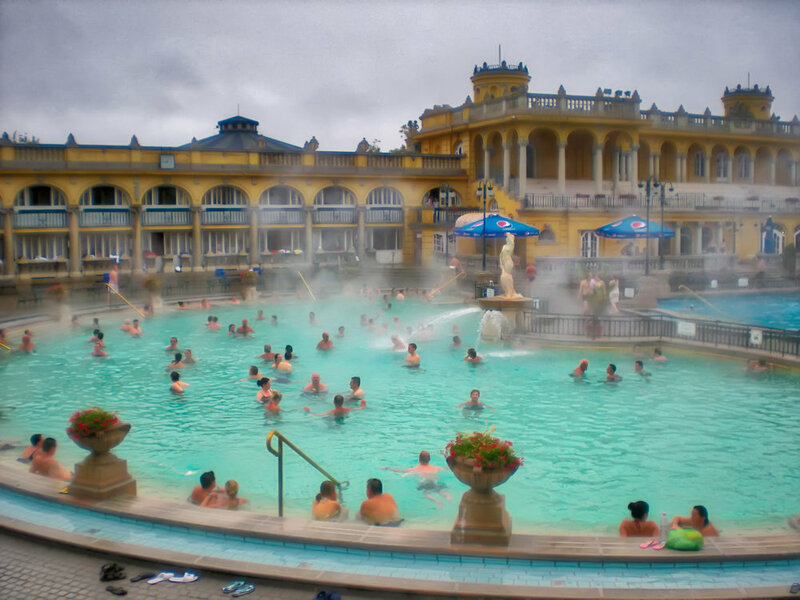 There is no other bath as the Széchenyi Baths!!! The Geller are pretty do not get me wrong but you can find similar or better anywere in the world! One of the last remnants of the Turkish influence in Hungary, a visit to the thermal baths is a quintessential Budapest experience. I haven't visited all of the baths in Budapest, but I have been to several of the most famous Budapest baths and the grandiose Széchenyi Baths are by far my favourite. Early morning or just before sunset is my favourite times for a soak in the thermal, healing waters of Széchenyi’s outdoor pools. ...and discover why Budapest is called the Pearl of the Danube! Ah, the Chain Bridge – one of my very favourite bridges in the world. It was the first bridge to permanently connect Buda and Pest and was completed in 1849. At the time, the Chain Bridge was considered to be one of the wonders of the world and the architect was so immensely proud of his work that he challenged anyone to find fault with the bridge. It is said that when it was discovered that the lions that stand guard at either end are missing their tongues, the architect committed suicide. The Great Market Hall in central Budapest is Budapest’s most famous marketplace. Whilst many locals still use the market hall as a place to buy their groceries, the market is incredibly popular with the tourists too. 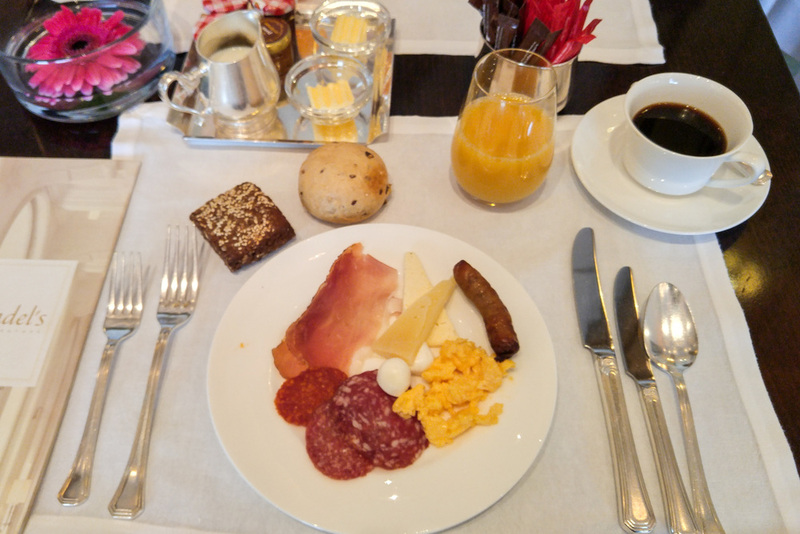 Locally grown fruits and veg, and locally sourced meats are found on the lower floors, and souvenirs including lace, chess sets and leather goods are available in the upper floors. As well as individual ingredients, it is possible to pick up homemade local delicacies like goulash and langos from the food stall upstairs. 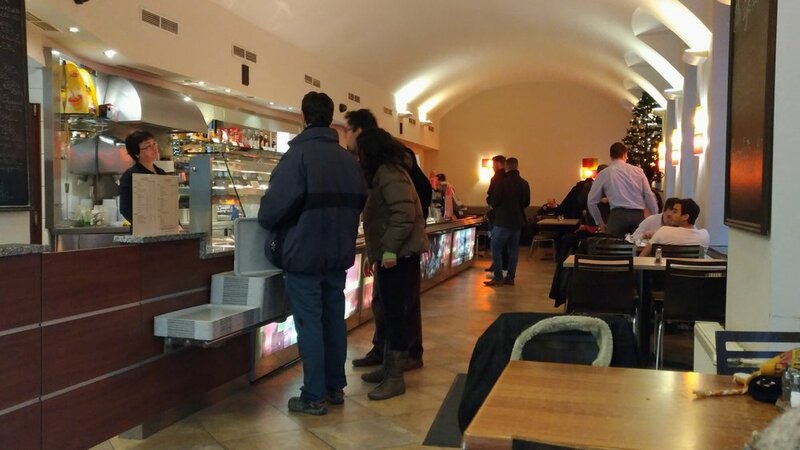 Budapest is full of cafes to have a delicious cuppa joe and try one of the sweets Budapest is famous for. Cafe Ruszwurm, on the Castle Hill, is one of Budapest’s oldest traditional confectioners still operating as a cafe. it is very cosy and small, has just about a dozen seats, There is a wide selection of the day’s fresh pastries, truffles, and coffee concoctions to choose from. The decor is charming too with antique furniture and tools of the old confectionery trade in the glass curio cabinets. Cafe Ruszwurm is located at Szentháromság u. 7 and is open 9am – 8pm Spring through Fall and 10am – 7pm in Winter. Completed in 1904, the Hungarian Parliament Building is one of Budapest's most famous landmarks. The National Assembly of Hungary still meets there to this day. Travelers come mainly to take in the building's architecture (primarily Gothic Revival style), beautiful statues and paintings, and national significance. According to many, there is no structure in Hungary that serves as a better symbol of the country's independence and commitment to democracy. Heroes' Square (or Hosök tere) is one of Budapest's grandest landmarks as well as the largest public square in the city. Swing by this area to take a picture of the Millenium Monument which was erected in 1896 to celebrate Hungary's 1000th anniversary. The square and the monument are dedicated to "the memory of those heroes who gave their lives for the freedom of our people and our national independence." At the base of the famous column (topped with the archangel Gabriel) are statues representing seven Magyar chieftains – considered to be the founders of the Hungarian nation. Behind the column are matching colonnades with 14 statues of royalty and other important figures in Hungarian history. The speed of ascent was actually slowed down as of 1988, to give passengers more time to enjoy their ride. The track is open daily until 10pm, so it is also a great way to enjoy views of Pest at night. This stretch of the Danube walkway goes from the Elizabeth Bridge to the Chain Bridge, and is perfect for those who want a short, but interesting walk. Promenading along the Danube is a great way to see many of the most famous sights in the capital. Sissy, wife of Emperor Franz Joseph and Queen of Hungary always dropped in the Gerbeaud cafe when she was in Budapest. 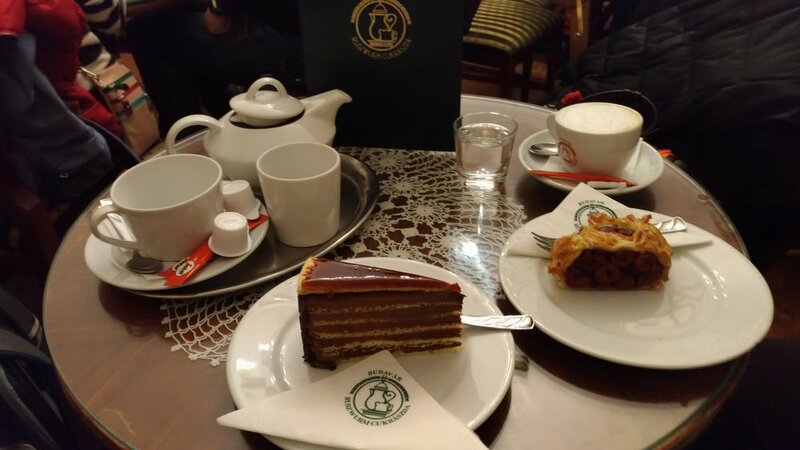 My super favourite remains the Dobos torte!!! I like very much the idea and feeling of sipping a cafe while surrounded by books and magazines. Once the residence of Manó Mai (1855-1917), photographer ro the imperial court, this 120-year- old listed building houses an exhibition hall, the Sunlight Atelier, bookshop and library. This is the main English language bookstore of Budapest. They offer decent prices and a large selection of travel books, both for Hungary and the other countries. You can find unique gifts for the book lovers in your life at Bestsellers. Street & River loves this place! It's a little quiet island in the heart of the city with great coffee and tasty, homemade cakes, cute service and a wide range of foreign language books. They seem to have everything.....except a coffee place! 1072 Budapest Rákóczi út 12. The service is always really nice too, answering all the questions we had about the dishes. Family and friendly staff. This is where you can find us in the evening when we are in the Capital! A new find, next to the beer owned Kaltenberg Restaurant. It is very nice and modern, Staff is attentive and the food is good! A simple, inexpensive cash-only eatery with only 5-6 tables (prepare to share the table with other guests). If you want to try hearty Hungarian food this the place to go. Menu in English is available. Daily menu (soup + main dish or főzelék + meat or sausage) from around HUF 800 -1 200. Try mushroom paprikash with galuska, or máglyarakás (a typical local sweet treat: layers of sliced crescents, apples, apricot jam, with meringue on top and baked in oven. 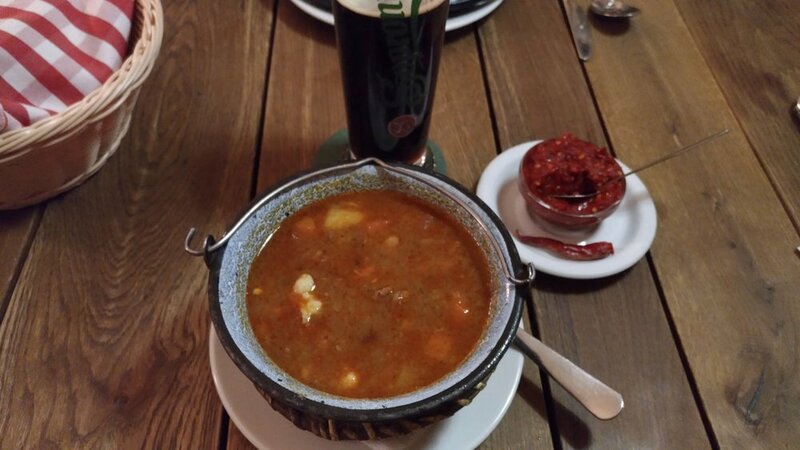 A pretty good-value, cheap restaurant in Budapest’s downtown, close to the Opera, with a daily menu of two options (a couple of soups, mains, and desserts): for 890 HUF (two courses), or 990 HUF (three courses). Desserts: pancakes (túrós=sweet cottage cheese, walnuts and chocolate sauce, jam): 420-515 HUF (two pieces), Chestnut puree with whipped cream (gesztenyepüré): 685 HUF. Address: Bajcsy-Zsilinszky E. út 15. , district V.
The small medieval Croatian village of Pican is perched on a 350 meters high hill in the Istrian hinterland, 10km south east of Pazin. Inhabited by the Histri tribe in early prehistoric times and later on by the Romans naming it Petina, Pican has lost its past importance and nowadays counts just 300 inhabitants. Pican is interesting for people searching for relaxation in its old houses surrounded by the charming countryside that offers numerous opportunities for hiking, cycling and other outdoors activities. The only visible evidence of the Roman presence is the inscription on the stone incorporated in the doorpost of the house facing the bell tower. Erected in 1872 this 48 meters high campanile that dominates the place is the third tallest in Istria. In the Middle Ages, the town was encircled by defensive walls that are preserved partially because, over time, they were mutilated by houses built on top of them. However, the main town gate, constructed at the turn of the fourteenth into the fifteenth century and renovated in the 17th century is well conserved. The fact that Pican was the administrative centre of central Istria as well as Bishopric seat confirms the significance it once had. The Diocese of Pican established in the fifth century by Byzantium was one of the oldest and smallest dioceses in the world that survived until the eighteenth century(1788). Although small, thanks to its role in the past Pican has conserved a couple of interesting sacral edifices. Before you enter the town on the left side of the main gate there is the small Church of St. Roch dedicated to the patron saint of people afflicted by the plague or other infectious diseases. Its foundation stone was laid in the beginning of the 17th century during one of the most severe plague epidemics. The park in front of the main gate to Pićan hosts the sculpture of St. John Nepomucene built in 1714. The tiny Romanesque Church of St. Michael from the 13th century is situated at the top of 365 meters high Calvary Hill (Kalvarija), next to the cemetery. The interior of this single-nave building is decorated with valuable Gothic frescoes from the first half of the 15th century that were enriched by the Glagolitic engravings during the 15th and 16th centuries. Being located on a hilltop, its natural viewpoint offers a spectacular view of the surrounding area. In addition, this beautiful view was embellished by the stone sculpture The Family by Nane Zavagno, who took part in the Mediterranean Sculpture Symposium at Dubrova near Labin. This parish church was built on the foundations of a former cathedral of St. Nikifor from the 14th century. The main nave of the old Medieval church was expanded in 1613 but it acquired its current external form after its thorough modification between 1753 and 1771. Its interior was also redecorated in baroque style and the main altar is adorned with a painting of The Annunciation by Valentin Metzinger. Tombs of the bishops of Pićan and other meritorious citizens of Pićan, decorated with relief and coats of arms, are placed under the church floor and the plateau in front of the church. Also, the notes of the “Pican's mess” celebrated in Old Church Slavon by the Glagolitic priests that is performed even nowadays are found there. Its bell tower stands separate from the church and offers a splendid view of the Istrian countryside. Pican is also the birth place of Matko Brajsa Rasan (1859. – 1934. ), choir master, recorder of old Istrian melodies whose birth home is located opposite the parish church. In 1912, he also composed the current official Istrian anthem Krasna zemljo after the lyrics of Ivan Cukon. Whole Pican has beautiful views of the Istrian countryside but the most beautiful view is from the church of St. Michael. The Franz Ferdinand's Viewpoint situated in front of the cathedral offers an unobstructed view over the undulating landscape of central Istria. The viewpoint of saint Helen, named after the church which once stood in this place is also recommended. In addition, this part of the old sleepy village is piled with old abandoned houses with rustic lintels and stairs cut in rock. 33 km long circular route Gracisce – Lovrici – Skopljak – Floricici – Sopot – Pican – Medigi – Montovani – Oric – Pazanci – Jakacici – Simuncici – Brunici – Gracisce is 50 % surfaced with asphalt that can be done in 3 hours. As the road is very demanding due to the great downward slope to Sopot and upward one to Pićan it is recommended to be ridden only in direction as described above. This 100% asphalted, 64 km long circular route of medium difficulty could be done in 3 hours. Its hiking points are : Pazin – Cerovlje – Paz – Susnjevica – Vozilici – Krsan – Pican – Gracisce – Lindar – Pazin. St. Nicefor 8 km long circular trail starting and ending in Pican for much of its length runs through fields. Its hiking points are : Pićan, Pedrovica, Vrh Kružac, Jelčići, Baldeti, Sv. Krištof and Lukeži. Also, two major Istrian waterfalls, Sopot and Benkovski, are located in the vicinity of Pican. The festival of Istrian legends, tales and myths is held at the end of July and at the beginning of August. Exhibition of young wines from central and northern Istria as well as from Labin region is held at the end of November and attracts a lot of wine enthusiasts and experts. St. Roch festivity, Pican's saint patron, with all day programme is held in the middle of August. Wine exhibition of eastern Istrian vineyards is held at the end of may. Public hunting area of Pićan , under the direction of the Kamenjarka Pićan hunting association is at the disposal of the hunters. Tourist office for Pican as well as for whole central Istria is situated in Pazin. This post has not been sponsored and I did not get media samples or freebies. For more information, check out my full disclaimer policy. Located due south of Rijeka in the Kvarner Gulf of the northern Adriatic Sea, Losinj is a hidden gem among Croatia's renowned Mediterranean island retreats. Measuring a mere 20 miles long by 2 miles at its widest point, this compact, idyllic oasis offers travelers a true getaway in every sense of the word. It features sun-drenched seas bordered by spacious, uncrowded beaches dotted with picturesque fishing villages that are reminiscent of a time long past. Traveling to Losinj takes some effort, which may account for the island's relative obscurity and refreshing isolation from the crowds that flood other destinations during the holiday season. Visitors need to take a car ferry and drive to the island, as there is no international airport. Once on the island, guests can begin to relax and indulge in the sights and sounds of this seductive place. The warm seaside climate delivers about 2600 hours of sunshine each year, fostering the growth of lush flora and over a thousand varieties of wild herbs that are both beautiful and practical; the herbs serve as natural mosquito repellents, making hiking and cycling the many trails a true delight. 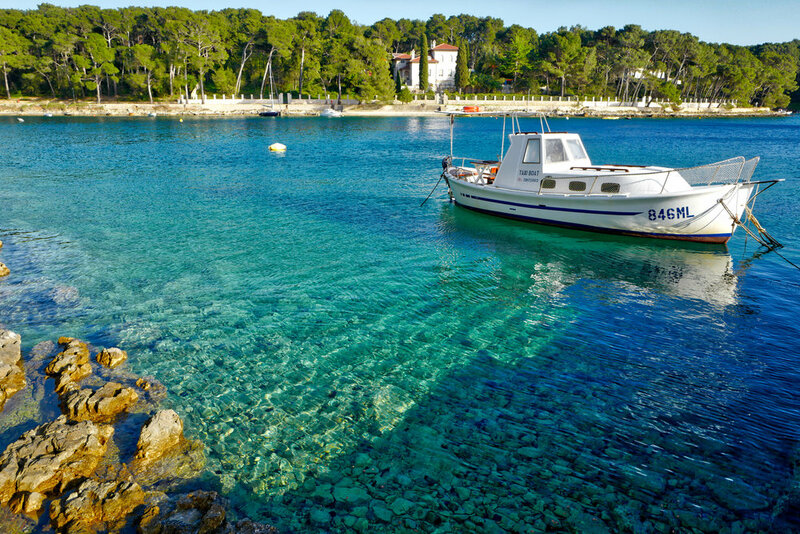 Also commonly known as the 'Island of Vitality', Losinj is known for its wealth of health resorts and retreats that focus on the restorative powers of the natural environment, and the locals have a reputation for looking, and acting, far younger than their actual age. Spas, therapy centers and sports facilities are abundant here, making this a wonderful destination for anyone who wants to indulge in world-class body treatments, herbal therapies and rejuvenation. The island is filled with unique restaurants and cafes serving fresh, local fish, pasta and area wines, providing guests with the opportunity to discover the tantalizing tastes of the region. Cikat Bay is the main tourist region, where windsurfers enjoy the warm waters of what is said to be the most beautiful bay in all of the Adriatic. Located on the shore of Cikat Bay in the town of Mali Losinj, Hotel Alhambra is a five-star hotel housed in a historic, centuries-old Austro-Hungarian villa that has been painstakingly restored and refurbished, creating a one-of-a-kind luxury retreat. Guests of the Hotel Alhambra stay in one of 51 private rooms and suites, including a limited selection of two-bedroom suites. Most rooms offer a sea view, while all come equipped with a balcony or terrace, en-suite baths with robes and slippers, air conditioning, satellite TV and complimentary Wi-Fi. The long list of hotel amenities include a private beach for guests, complete with parasols and sun loungers; a heated indoor sea-water pool; 24-hour room service; butler service and a full fitness center. There are both Turkish and Finnish saunas, and expert masseuses are available for in-room massages and body treatments. In the main area of the hotel, an upscale lounge serves up premium cocktails and wines, while the on-site restaurant features an eclectic menu filled with regional and international offerings prepared by expert chefs. Hotel Alhambra is just a short half-mile walk away from the shops and cafes of Mali Losinj, providing easy access to the best the island has to offer. A marina is also close by, providing guests with access to scuba diving outfitters, charter boat tours and watercraft rentals. 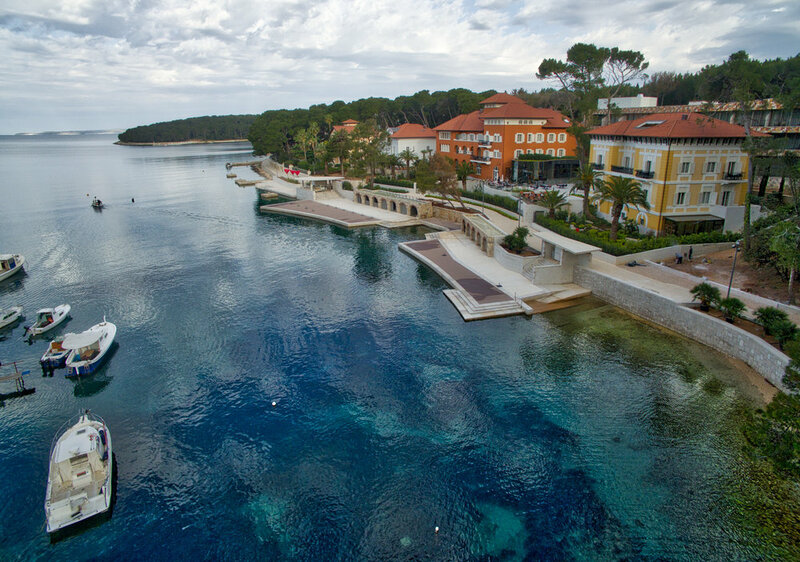 For those who are seeking a relaxing, sun-filled vacation on a true island paradise that blends old-world charm with modern amenities and service, the Hotel Alhambra on Losinj Island is an ideal choice. Travelers to Losinj are advised to reserve accommodations in advance, especially if they hope to secure space at one of the island's most sought-after hotels, Hotel Alhambra. The town was first mentioned in 1398, under the name Malo selo ("small village"). In 1868, it experienced its golden year. There were as many as eleven shipyards, and it became the place with the largest and most developed merchant marine in the Adriatic Sea, even ahead of cities like Rijeka, Trieste and Venice.American author Kenneth Roberts observed that the little town, , seemed to have "produced a hundred seamen for each one produced elsewhere." Writing in 1938, Roberts said there were currently "four hundred sea captains living on Lussinpiccolo, The place is lovely with many restaurants. Veli Lošinj is a superb little place has 901 inhabitants and a mild climate and caters to tourists. It is located 5 km from the town of Mali Lošinj. It was an important port and fishing centre until the late 19th century. Today it is known as a tourist and aromatherapy centre. The first mentioning of the town dates back to 1398 by the name of "Velo selo". The oldest core of the city was built between the 13th and 14th centuries around the Romanesque church of Sv. Nikola (Saint Nicholas) from 14th century. The town grew along agricultural alignments, not along lais-out city streets. In the 15th century the still-standing defensive tower was built, erected to defend the harbour and the settlement, but also to protect the locals from pirate attacks. A real hidden gem just off Veli Losinj it is for sure worth a visit! This post has been partially sponsored I did get media rates during my stay at Alhambra Hotel. For more information, check out my full disclaimer policy. The first thing you'll notice when you step into view of Slovenia's Logar Valley (Logarska Dolina) is the way the clouds settle lazily between the alpine peaks in a way that seems to suggest the halt of time. I'd heard this glacial valley pass was one of Europe's hidden marvels, and I wasn't disappointed, for a multitude of reasons. My trip through the Logarska Dolina was basically an unending string of breathtaking views. The geography of the area is marked by stretching pastoral meadows surrounding by mountain ranges, all of which is constantly green and fertile. The properties of the valley can be traced back to its roots, as a Ice Age glacier split what is known today as the Kamnik-Savinja Alps. What results is a lush basin, dotted with green farmsteads and stretching up into the brilliant peaks of the valley's adjacent mountain ranges. What immediately stood out to me about the Logar Valley was how despite being a location growing in popularity with tourists, it remained undeveloped and in many ways, seemingly untouched by human hands. The inhabitants of the valley are just a relative handful of farmers and commerce leaders, most of whom have lived in the area for generations, culminating in a respect for their place among the valley and a role to preserve its rich nature. The duality between everyday lifestyle and tourism in the Logarska Dolina seems to balance in a way that doesn't cripple either side. Hotel choices are abundant, and available for almost any price range, but staying in the valley felt like being part of the small farming community, rather than simply a tourist. Similarly, the quality and variety of the food in the Logar Valley showcases the finest offerings in this region of Europe, but restaurants were reminiscent of what you would expect within a small farm-based community: quaint and effortlessly comfortable. What I found to be an understated upside about the Logarska Dolina, and the entire region, was the fact that the views, attractions and great accommodations were available at very fair prices. In a time when many tourist attractions come with a high rate of inflation, the Logar Valley was a great value. 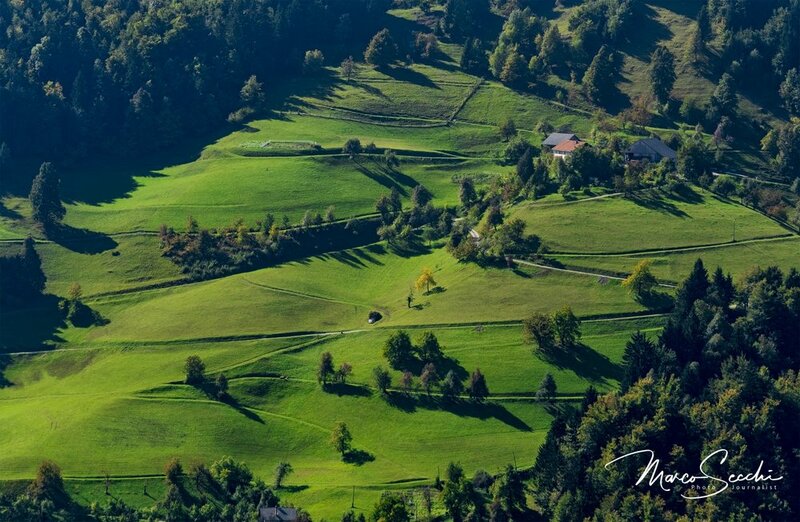 Wander through the farmsteads and meadows, or plan excursions up into the breathtaking peaks of the Kamnik-Savinja Alps. In the Logarska Dolina, the views are plentiful, the nature is rich and the possibilities are endless. 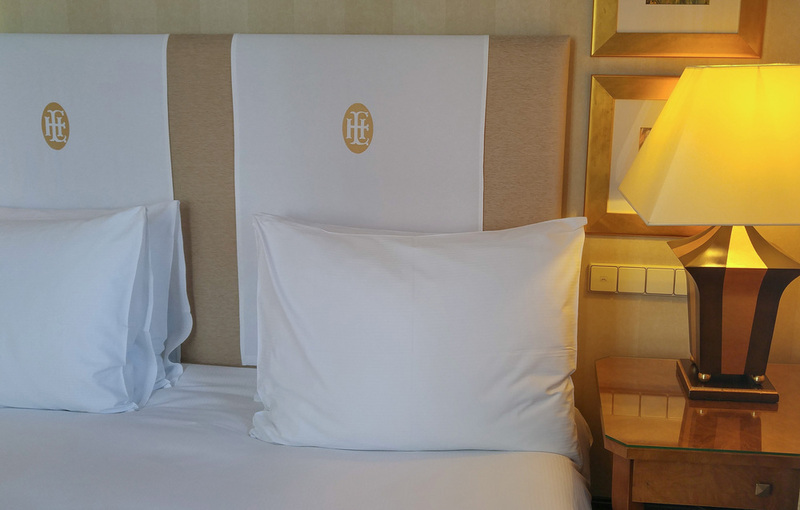 Luxury was the first word that came to mind as I walked into Esplanade Hotel Zagreb. From the breath-taking columns that held up the hotel to the old-school elegant exterior to the art décor lobby, I knew that my visit was going to be a great one. This luxurious hotel definitely lived up to all the hype. I was excited to check-in and get to my room. First, we got a really warm welcome from the bellboys that took care of my car and luggage. Then the front desk clerk made the whole process quick and easy, all with a smile on her face. Overall, the check-in process was top-notch with superior customer service. Entering the room I was in awe. I had stayed in many hotels, and this was by far one of the most stunning room that I'd been in. The décor was beautiful and quite unique. Not to mention, the room was huge. Even the bathroom was quite spacious and luxurious with its marble, high-end toiletries, and super soft robe. The view of the city was pretty amazing, too. I was impressed by the complimentary Internet, welcome gifts, chocolate and teas and the post cards. Zinfandel's Restaurant - Breakfast was really impressive. The selection is magnificent, everything is fresh and prepared using only the best produce. The breakfast room has a lively and buzzing atmosphere. The service was impeccable as my waiter was very attentive. The hotel had quite a few amenities that I did not get a chance to use on this visit, but would love to try them in the future. There was Oleander Terrace and Esplanade 1925 Lounge and Cocktail Bar. Overall, I enjoyed my stay at Esplanade Zagreb and would recommend the hotel to anyone planning to visit Croatia. The historic building, the gracious accommodations, the award-winning food, the personalized service, the centralized location, and so much more all make it the most prestigious hotel in Zagreb. This post has been partially sponsored I did get media rates during my stay at Esplanade Hotel. For more information, check out my full disclaimer policy. Zagreb, the Croatian capital, is beautiful year-round, but during the Advent it looks its best. Christmas trees, lights, decorations, delicious foods and beverages, along with joyful holiday goodness made Zagreb one of the best Christmas destinations in 2015 and due to the festive and welcoming atmosphere, it was also named Best Christmas Market 2015. Along with the festive, holiday mood, there are many activities that bring the Christmas spirit to Zagreb. Surprise and suspense fill the air as the Advent calendar comes to life in Zagreb's main square. Visitors enjoy the holiday spirit and take part in festive events including readings, concerts, lectures, workshops, performances, exhibitions, and light installations. The city's old music pavilion welcomes visitors to dance, sing, eat, shop, and enjoy their time amongst the cheerful decorations and jovial atmosphere. Talented artists make their beautiful, unique ornaments and souvenirs available. Hungry visitor can choose from many delicious Zagreb specialties, including fried apples, cabbage clothes, baked štrukle, as well as mulled wine and hot chocolate. Music fills the air, too. Waltzes, Christmas classics, and other musical treats are enjoyed by all. Situated at the city's main square, the open air stage hosts many unique festivities, including concerts, children's performances, and cultural and art events. Surrounding Jelačić Square, Zagreb's artists and craftsmen offer traditional Croatian products. Shoppers are able to choose from colorful decorations, gingerbread hearts, cookies, jewelry, souvenirs, and a plethora of seasonal gifts. Just like a Christmas fairy tale, the ice skating rink is home to skating, delicious foods and beverages, and joyful music events. The Advent in Zagreb is a special event that is not to be missed. Join in as visitors stroll the city streets and sing, dance, eat, shop, and enjoy the festive entertainment in Croatia's capital city. A glass of Medica will put you in a good mood straight away. Its Rakija made out of honey and spiced with propolis. Medica is a devil in disguise. It's sweet, flows smoothly, and once you get going you don’t really stop until it’s too late. It has a certain jet lag effect as it can kick you long after you had your last one. Fritule are aromatic bite-sized dough balls, flavoured with lemon and orange zest, grape brandy and/or dark rum, and sprinkled with icing sugar or covered with chocolate. Like almost any home will have its bowl, there is probably no housewife, especially among older women, that doesn't have her own recipe, the best in the world! A trip to Zagreb can be life-changing. It provides one of the very best opportunities to experience the Croatian lifestyle. This city offers a wide range of indoor and outdoor things to do. You could spend your afternoon walking along the beautiful cobblestones of St. Marks or spend some time at an apothecary shop that dates to 1355. Yet much of the city is quite modernized, offering all of the finer things that people enjoy. The architecture and the rich history of Zagreb are what dominate the landscape. It is these features that many people come to see especially the 1,000-year old Gornji grad where the Presidential Palace is and the post-World War II Novi Zagreb area which is a much more modern space. Aside from the architecture, you'll find this city has more museums per square foot that virtually any other city. For those that love history, it is a treasure trove of opportunities. The Zagreb Cathedral with its twin neo-Gothic spires dominate the square. You'll find the tomb of Cardinal Stepinac here. The Dolac Market is the largest and most colorful of all in the area. Enjoy some of the local food here. Kamenita vrata or the Stone Gate in upper town is a beautiful 13th century gate with a significant amount of history dating to 1731. The Funicular railway is below the Lotscak Tower. It takes to 1888 and is the oldest form of public transport in the city, which at the time was a horse-drawn tram. You can take a ride along the railway and see much of the city up close. Strossmayer Gallery of Old Masters and the Museum of Naive Art is an ideal choice for those who want a dazzling display of artifacts. When visiting Zagreb, you'll find the area is full of culture. Step back two centuries to the many towers and buildings here or enjoy both the traditional and more contemporary meals prepared here at local cafes. Take the path less traveled by tourists by visiting Maksimir Park and Lake Jarun. You can also visit the nearby towns of Varazdin and Samobor. With numerous restaurants, local coffee shops, various entertainment venues, and dozens of stalls and shops, this is an ideal place to visit if you want a bit of history on the city as well as the region. It virtually comes to life with every cobblestone step you take. 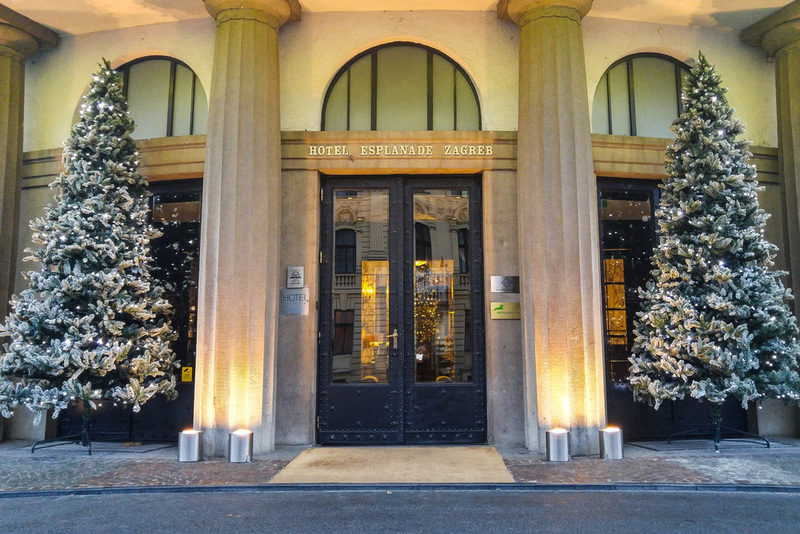 I stayed at Esplanade Hotel the most luxurious hotel of Zagreb and super Central, see my next post. If you are passionate about Strukly...then there is only one place ...La Struk. Superb strukly are freshly served all day. If you are going in winter the place is quite small.....but they are really worth the wait! This post has been partially sponsored I did get media rates during my stay at Esplanade Hotel . For more information, check out my full disclaimer policy. Metelkova City the full name in Slovene I think is Avtonomni kulturni center Metelkova Mesto, is an autonomous social centre in the centre of Ljubljana, Slovenia. It is located on the site of former military barracks, the Slovenian headquarters of the Yugoslav National Army, and was squatted September 1993. The site consists of seven buildings and is 12,500 m² in area. The squat is named after nearby Metelko Street (Slovene: Metelkova ulica), which is named after the 19th-century Slovenian Roman Catholic priest, philologist, and unsuccessful language reformer Fran Metelko. Originally they used to siphon the water illegally but today Metelkova is legally connected to the city's water system and power grid. Today Metelkova city is made up of bars. clubs, art galleries, design studios and related activities. It hosts a range of alternative music gigs including punk, metal, techno, etc. All opinions are my own. This post has not been sponsored and I did not get media samples or freebies. For more information, check out my full disclaimer policy. It has a medieval fortress and a scary dragon, but do not get afraid Slovenia's capital is a safe, lovely, amazing place in which to relax. Ljubljana is sophisticatedly pretty, with its candy-coloured baroque and dizzyingly ornate Secessionist architecture. You can certainly spend a great deal of money on a hotel in Venice. A night at the Gritti Palace in high summer will set you back at least £750. But for the same amount you could enjoy an entire week in most of the hotels listed here. You won’t get the same status, or quite the same service, or the same superb location, but you will still find a decently sized room, lots of character and a warm welcome. Locanda Orseolo (Corte Zorzi; 041 523 5586; www.locandaorseolo.com; £160). Step inside the hotel and you might be in a compartment on the Orient Express: elegant, enveloping, and richly coloured and furnished. But it’s the warmth of the young team at this equally young 15-room hotel that makes it really special – Matteo, Barbara and their brothers, sisters and friends. In the morning, Matteo dons an apron and cooks pancakes and omelettes to order, Barbara serves and everyone chats. The comfortable bedrooms are being transformed to echo the ground floor, complete with hand-painted murals and canopied beds. Secure one and you’ll have a real bargain. Located in the historic centre of Venice just a stone’s throw from St Mark’s Square (five minutes walking distance), the Centauro Hotel offers elegant, welcoming accommodation from which you can enjoy the city’s art and culture. Housed within an ancient palace from the 1500’s, the Centauro Hotel has Venetian style furnishings from the 18th century and 30 comfortable guestrooms. Rooms have air conditioning and satellite television, some have canal views and those on the top floor have a private terrace from which you can enjoy panoramic views over the rooftops of Venice. Al Ponte Mocenigo This is another charming 16th-century palazzo, so tucked away that you could walk right past and never know it was there. You will find one entrance down a very narrow alley just up from the San Stae vaporetto stop; the other is on the opposite side, over a small bridge. Officially it is a two-star hotel, but frankly it rivals many establishments with double that number of stars. The very smart, high-ceilinged rooms are in Venetian styles and colours. The best are numbers five and six, on the first floor overlooking a tiny canal to one side (they are classed as “superior” doubles and cost £128 in mid-season). Not only the ambience was very appealing also the price performance ratio was excellent! The Restaurant, it is also a Pension so has room, has a small nice car park anyway parking is not a problem in Pressiano. The menu and wine list is well chosen and clearly for everyone. With my wife we had a fantastic Kaiserschmarrn and a Ravioli with Finferli we also had a nice Strudel. On the second day in my circle of relatives there were no complains. All were satisfied to the utmost with the food. Especially noteworthy was the service: friendly, attentive, courteous and unobtrusive, and very professional. In a next stay in Merano I will definitely visit again restaurant Prissianerhof! This restaurant is especially recommended. The menu offers a wide variety of mouth-watering dishes. I had the Ravioli with Mushrooms while my wife tried the Kaiserschmarrn. They were both exquisite. It all was followed by a delicious strudel served with a scoop of vanilla ice cream for dessert. All the products were fresh and the dishes had the warmth of home-made food. The chefs take great care in selecting the best quality ingredients. The service did accompany the high quality of the cooking. Waitresses were friendly, helpful and very attentive. One of the owners was always around willing to exchange some kind words with all her clients. The price is very good value for money I had a pleasant dining experience with food of the most exquisite flavours. For this reason we did went back and I highly recommend going to the Falger restaurant. The first hotel to be built along the Adriatic Coast in 1884, Hotel Kvarner Opatija is a historic property often seen as the standard for elegance and sophistication of hotels in Opatija. 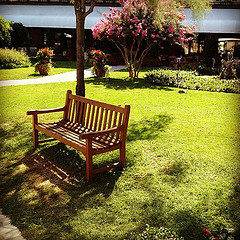 Some of the more memorable visions of Opatija are on the grounds of Hotel Kvarner. The Crystal Hall is an awesome architectural sight and the largest of its kind in Opatija. It is an ideal setting for personal events like weddings or business summits. The newly-renovated terrace, situated above the Lungomare promenade, is the perfect spot to hold your outdoor event with its offer of magnificent sea views. Villa Amalia is in Kvarner's immediate vicinity and villa guests can use all the amenities of the historic hotel, including the outdoor swimming pool and private beach. Close to the city's most famous landmarks, Hotel Kvarner offers excellent accommodation on the Opatija Riviera. Built in neoclassicism style, the architecture of Hotel Kvarner really stands out. The façade has been restored to its original masterful appearance. Large windows allow for wondrous sea views. The highly-detailed interior recalls style of the past. Hotel Kvarner breathes history and class. It is for me one of the best hotel I have ever experienced! The location is just wonderful, right ON the coast with its own "beach". The service was excellent and so were the rooms. Air conditioning work very well although it was well above 30 degrees outside. We had a lovely view over the sea from our room, and our own huge balcony. Loved it! Every night there was some kind of music on the large patio next to the restaurant, lovely to have dinner and listen to great music meanwhile! Th the dinner buffet as well as the breakfast is great! This post has not been sponsored. For more information, check out my full disclaimer policy.